Learn techniques for the safe use of Surface Marker Buoys and Delayed Surface Marker Buoys. Surface Marker Buoys (SMBs) and Delayed Surface Marker Buoys (DSMBs) serve a range of purposes, from allowing others such as shore cover / boat support to identify an ascending diver; to alert boat traffic to the presence of a diver; to providing a visual reference for divers ascending or completing a safety stop. 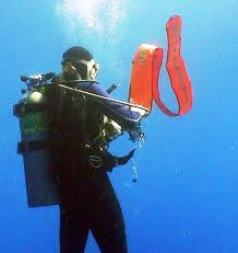 They are popular for use in areas with heavy boat traffic, or where divers may be drifting in a current. They are also used when divers are unable to return to the shot line to ascend, or where divers may not have a visual reference once they end the dive. You will learn about different types and styles of SMB and DSMB buoys. When to use each type. How to safely deploy them. How to deloy them from static positions and in mid water. On completion of the course you will be awarded the PADI Surface Marker Buoy Distinctive Specialty diver award. This can be accredited as one of the five speciality ratings a diver has to attain to achieve the highest non-instructional qualification on the PADI curriculum – Master Scuba Diver.